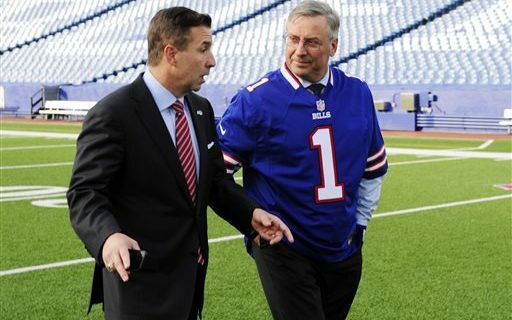 Former Bills CEO & President Russ Brandon is now also in charge of the Buffalo Sabres, as Pegula Sports & Entertainment CEO. But with the Sabres recent struggles, Buffalo Sports Page humorist Jeff Wozer is wondering if Brandon really knows hockey. • Thinks Lady Bing is an Internet search engine for women. • When looking at the Sabres’ 2017 schedule he was shocked to learn Montreal has a franchise. • Thinks Boom Boom Geoffrion is the brand name of a Canadian laxative. • Suspects the playing of two national anthems before each home game has nothing to do with Canada but everything to do with Doug Allen milking the clock. • Thinks “Miracle on Ice” is the title of a Disney on Ice show depicting Minnie Mouse giving birth. • To increase the Sabres fan base wants at least one home game to be played in Toronto. • Thinks the term “original six” refers to Marvel Comic superheroes. • Complains repeatedly that none of the figures in the French Connection statue bear any resemblance to Gene Hackman. • Thinks “The Instigators” is an Aaron Sorkin crime drama. • Is always shocked that no one else finds it so coincidentally wild that one of the Sabres four retired jerseys just happens to bear the same name as the Tim Horton donut chain.